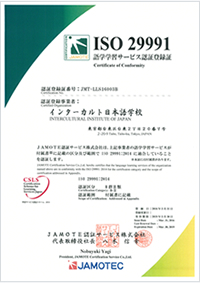 We have been certified by the International Standard of ISO29991:2014 (Language learning services outside formal education -- Requirements), set by ISO (International Organization for Standardization), on March 31, 2016 (certification body: JAMOTE Certification Services Co., Ltd.). An ISO29991-certified organization is required to maintain its quality level that satisfies the strict international standard every year. We keep going forward to provide language learning services at a still higher level. 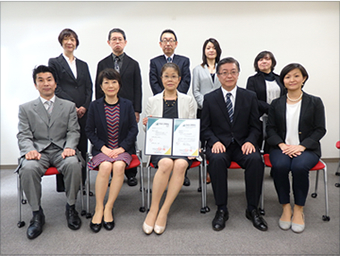 We have been certified by the International Standard of ISO29991:2014 (Language learning services outside formal education -- Requirements), set by ISO (International Organization for Standardization), on March 31, 2016 (certification body: JAMOTE Certification Services Co., Ltd.). It applies to the language learning services of any category or scale, including language learning services organizations, associations, and unions. It can also serve as a tool for looking back and self-evaluation for formal education institutions such as schools and universities. - Language learning environments, assessing language learning, evaluating language learning services, sales promotion and public relations of language learning services, information regarding language learning services for enrolled students and sponsors, tuition fee invoice, and so on. JAMOTE Certification Services Co., Ltd.